Within the CASG in Melbourne, Dr. Arvind Kumar Sinha heads engineering for the Australian military helicopter and tactical unmanned aircraft systems (UAS) programs, providing executive advice and support at the division level. “We look after the capability life-cycle from acquisition, through sustainment, to disposal, for both Army and Navy Aviation,” he explained. “We are going through various acquisitions. As far as Navy aviation goes, the last of 24 MH-60 Romeo aircraft is being accepted now. For the Army, we have 38 of our planned 47 MRH90 Taipans accepted, and we have acquired 10 CH-47Fs, with the last three in the final stages of Australian modifications. The H135 training aircraft being acquired as part of our Helicopter Aircrew Training System (HATS) is to replace the Squirrel in the Navy and the Kiowas for the Army.” CASG sustainment teams are also responsible for Black Hawk and Tiger helicopters and the Shadow 200 UAS. Working with Australia’s Defence Science and Technology Group (formerly the DSTO), Dr. Sinha has been instrumental in driving Strategic Research Programs with platform-wide application. Key areas are in composite airframe durability and degradation, on-board systems obsolescence and capability upgrades, and unmanned and manned aircraft systems integration. Dr. Sinha established and organizes bi-annual Army and Navy Aviation Symposia that provide interactive updates from government agencies, industry, military capability managers, regulators, and research organizations and academia. Manned-unmanned teaming was a key topic at a recent Navy Aviation Symposium. Dr. Sinha noted that such network-centric operations against an unconventional adversary require a high degree of flexibility in both technology and tactics. “They both go hand-in-glove.” He added, “Target imagery acquisition, designation and hand-over technology needs to be multi-platform based — aerial, ground, surface or sub-surface. Technology also has to be in tune with the tactics employed at that point in time for optimal mission effectiveness. This strategic forethought needs to be incorporated in any tactical aerial platform during the acquisition and sustainment phases. High density altitudes limited both the types of helicopters that could be used and their utility. “At that time, we had the Cheetah [the SA 315B Lama manufactured in India under license]. It could land at certain posts with low payload capacity — essential supplies, a passenger or casualty, or a few jerry cans of fuel.” The bigger Mi-17s of the Indian Air Force could land at the base camp but only paradrop supplies to high mountain posts. “Now, I understand, they have the HAL Advanced Light Helicopter operating up there. Sinha earned his Doctorate in Helicopter Design with a Systems Engineering Approach at RMIT. He subsequently returned to India, rose to the army rank of lieutenant colonel, and became dean of the new Faculty of Aviation in the same military college — MCEME — where he did his original engineering studies. However in 1999, RMIT offered the highly experienced and qualified soldier-engineer the opportunity to continue his work as a senior researcher in the RMIT Sir Lawrence Wackett Centre for Aerospace Design Technology, where DSTO contracted work on the Australian Navy Seahawk. 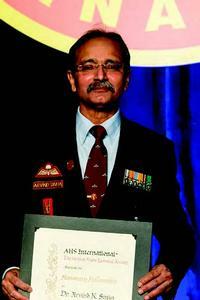 Lt Col. Sinha was granted premature retirement from the Indian Army to assume his new role. “I joined the Research Center at RMIT University and in a year became the Manager of the Aerospace Design and Commercial Office. After another year or so, I was offered to lead the Centre as its Director.” The RMIT University Wackett Aerospace Centre continues to partner with industry on fundamental and applied research through commercial contracts. Australia has ongoing research efforts in key rotorcraft technologies. “Brownout certainly is an issue which the DSTG is working on,” noted Dr. Sinha. However, the Australian aerospace industry today rarely undertakes its own new major aerospace development programs. “We have become part of international programs,” explained Dr. Sinha. “There are subsidiaries here of international companies, Airbus, Northrop Grumman, Lockheed Martin and the like. Lockheed Martin has taken the initiative to establish one of its research hubs which will introduce front-end technologies.